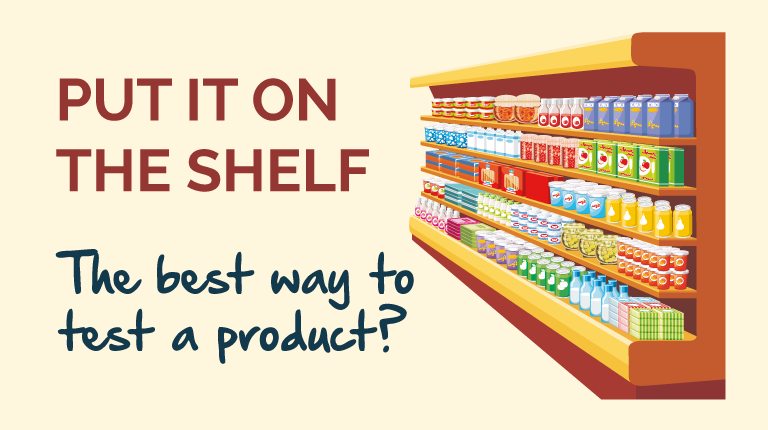 PUT IT ON THE SHELF: THE BEST WAY TO TEST A PRODUCT? 25 Jan PUT IT ON THE SHELF: THE BEST WAY TO TEST A PRODUCT? But is this relevant in the current market; with discerning consumers that are more promiscuous and well-informed? M&S food was highly regarded, not just in the UK – but globally for its “rate of food innovation and quality”. I remember leading USA, European retail and foodservice players coming to the UK to witness and admire the food innovation that M&S had to offer. In this era thousands of products were launched across categories, every season. Each range would be reviewed after the season – or in some cases after a few weeks if they were “dogs” or “shelf cloggers”. Changes, re-ranging and modifications to the marketing mix would be made for the “refresh or re-launch”, ready for the next season. These changes, range rationalisation or category management were often based on fairly basic qualitative and quantitative data and insights. However, it seemed to work with M&S branded food with it being perceived as premium in the market with strong brand values and loyalty. This positioned M&S food as the benchmark for other leading food retailers. However, this is not the case for everyone and the honest appraisal of Dave Lewis at Tesco regarding their current challenges was: “We ignored our customers, suppliers, colleagues and lost sight of our brand values.” He suggested that Tesco became “One dimensional and results and net margin obsessed”. This lost the trust of suppliers, colleagues, stakeholders and ultimately the consumer by seriously undermining their key brand values! This lack of consumer insight is astonishing, particularly given that during the previous two decades Tesco had led in this area with an endless stream of pioneering activity and initiatives that were consumer-led. We can also recognise a part of the success (but not the only reason) for the impressive growth of the discounters: Aldi, Lidl etc. is that they have been more consumer driven during the last decade of recession, austerity and a more discerning, less loyal/promiscuous consumer. However, they still represent a fairly small percentage share of the core grocery market. So how, in this digital, information-rich era, are suppliers and retailers struggling to ensure their organisations and product offers are consumer driven? Clearly there are many reasons, however I believe we are struggling to process the complex sources of data (online, social media, consumer groups, call centres etc), quality measures, technical specifications, consumer panels, accreditations and industry initiatives etc. In this new big data era it becomes essential that retailers can obtain “one view” of what consumers are saying about their products and brands. Consolidating this myriad of data inputs across multiple channels through the chain necessitates a new approach to “supplier engagement”. In my mind this is similar to the step change made when category management first came on the scene. So it will require equal energy and support from growers, suppliers and retailers if we are to capitalise on this new digital, information-rich world we live in. A possible solution to this is offered by S4RB with their UBX LINK™ system which offers “one connected community” and Unified Brand Experience (UBX), through providing “One View” of product performance; a consolidated view of sales, benchmark assessments, consistency testing and consumer feedback from stores, call centres and returns. Whilst this system has been very successfully pioneered and proven in the USA (with Walmart) and with various UK retailers, I believe the big breakthrough will come from progressive and innovative UK suppliers that pioneer this approach to differentiate their position with their retail partners and brands. Time will tell whether UK suppliers are brave enough to take up the challenge. Perhaps this is moving “back to the future” in “the best way to test a product is put it on the shelf”. Find out more about implementing a Unified Brand Experience.